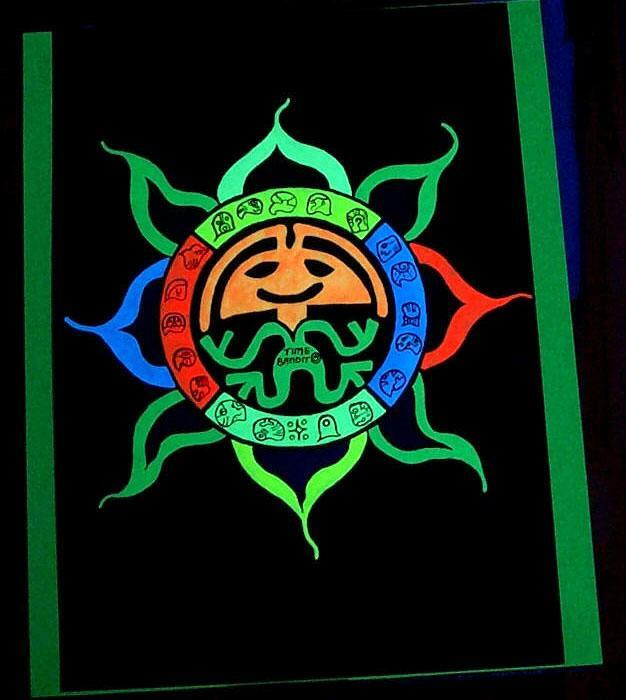 DRP began at the 1997 Mayan Dreamtime Festival in Glastonbury. The festival was organised by the Sun & Serpent Mysteries School and was DR's introduction to Ceremony and to the calendrics of the Ancient Maya. This festival (and the subsequent Dreamtime celebrations in 1998 & 1999) included presentations by Ariel Spilsbury, Aluna Joy Yaxkin, John Major Jenkins and José Arguelles and they spoke about the nature, scope and origins of Mayan Time. The enthusiasm and dedication of these people - and the many others who participated in these three events - was the motivating source of DRP. The primary aim of the DRP is to investigate and express the patterns, colours and myths that are central to the cycles of Mayan Time. Although only a small number of Mayan books have survived to the present age much of their extant lore is engraved in monumental stone. The beauty and rhythmn of Mayan time is but poorly expressed as black text on a white page. The Dr Rock Project is currently crewed by DR and his webmaster Al Gorithmyk. DR deals with the metaphysics and Al does the hard sums. There are many, many publications and websites which examine the complexities of Mayan civilisation. The intention of DRP is to take parts of this mass of information and present it as colour and form using modern media and plenty of rocks. Honouring the Source provides references to the people who have influenced the development of DR's images and, where relevant, publication details. This is effectively a bibliography which allows for further reading on everything from the beliefs and practices of the 21st century Maya to the astronomy and gods of their preclassic forebears. Heroes and champions of library and field - hail to the Divine within each of them. The interpretations of numbers and glyphs which are presented with DR images have their original being in the interpretations of people credited in Honouring The Source and they have been subsequently modified by personal experience. Just as every individual has a unique place in the complex of cycles which is the Tzolkin, so every person's view of the signs and portents of their time will be unique. Where we are and who we are defines what we experience. The Tzolkin acts as a template within which the character of time and relationship may be revealed. The Ancient Maya reached the height of their powers towards the end of the first millenium CE. They were measuring time with astonishing precision using repeated cycles of 7, 9, and 13 days. Time was known as 'Lord Kin' and individual days were also known as 'Kin'. Time was a reusable resource which spiralled and returned repeatedly through the history of our world and through each of our own ancestral souls. So it was that the movements of the stars and planets came to govern not only the agricultural and civil calendar but also the myriad lives of which individual tribes are composed. The 260 day cycle known as the Tzolkin is a common factor to most mesoamerican calendars and their derived siblings. The Haab, Long Count, and Bundle of Years are also widely distributed means of recording the Earth's position in space and the nature of the age within which humankind expresses its inheritance. There is some disagreement between various authorities as to how all of this should be linked to our established Gregorian calendar. DR concentrates on the Tzolkin as it is a self-contained template of characteristics and correspondences which does not require reference to the wider scheme of things. DR prefers to use the Jaguar Wisdom -Gregorian correlation rather than that of the Dreamspell. This distinction is made solely on the fact that the Jaguar Wisdom system counts leap days whereas the Dreamspell system does not. It may be helpful to remember that José Arguelles describes the Dreamspell calendar as a Galactic Calendar which is based on the Tzolkin and acknowledges that there are differences in application between the Dreamspell and a multiplicity of traditional counts. The contemporary Quiche Maya calendar slips against the Gregorian calendar by one day in every four years and these two counts will synchronise for four years early in the 23rd century. Although DR does not use the Dreamspell -Gregorian correlation, his art makes considerable use of José's ideas and imagery. Al's Mayan Date calculator shows all of these various options and applies José's Dreamspell words to his own count as well as to the Jaguar Wisdom count. The text is accompanied by a selection of Doctor Rock's Illuminated Alluvials. Frequent attention to these words, glyphs and to the ideas that they bring to mind is an excellent introduction to the Count of Days, the Ahau Kin and the 13 Tones of Hunab Ku. 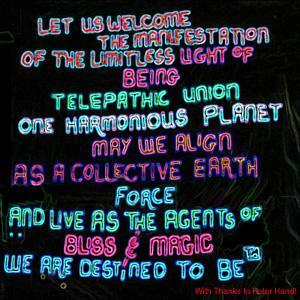 At first sight, the daily Dreamspell mantras look odd and incomprehensible to many people - it may help to look at them in the morning and then again at the end of the day. The richness of daily experience is often quite clearly represented by the Dreamspell words. When we change our attitude to time, time treats us differently. If we come better to understand our relationship with time we may better understand ourselves and others. This website adds to the work of millennia. DR hopes it will be useful and beautiful. So does Al, probably. Alchemy and Alchemists Sean Martin 2001, Pocket Essentials A tiny book packed with information and no space wasted. 1st half is a history of alchemy its themes and ideas. The second half is a chronological compendium of alchemists with brief comments on each. Novel charting the life and imprisonings of an accomplished alchemist. Based quite tightly on the life of Roger Bacon; plenty of papal bull. A first class read. The Elements - A Very Short Introduction Philip Ball 2002, OUP From Aristotle's quartet to the chemical brothers. Read all about 'em. Another refreshingly small book. www.levity.com/alchemy A more or less infinite source of well organised, free info. Most uplifting. Uriel's Machine Knight and Lomas 1999, Century Books Source of material on the megalithic site at Newgrange. This book has a wide ranging brief: ancient tales of ancient floods, cometary impacts, the Book of Enoch, megalithic builders and modern free masons. A persuasive and engaging text. Many great photos of UK megalithic sites. Stardust - the cosmic recycling of stars, planets and people, John Gribbon 2000, Penguin Neutron capture and beta radiation. It's all you need. The fundamentals of matter for real people. The Planets David Sobel 2005, Fourth Estate The location of the planets helps to define their elemental makeup. Includes an especially entrancing description of the birth of a sun. Where Stardust addresses atoms and stars, The Planets does the bits in between. the Ancient Gods - The History and Diffusion of Religion in the Ancient Near East and the Eastern Mediterranean E.O. James Phoenix Giant 1999 (originally 1960) Full of info it's hard to get elsewhere – the story of how the gods moved out of Sumer and much more besides. the First Civilizations – the Archaeology of Origins Glyn Daniel 1968, Camelot Press Based on a series of lectures given by the author from 1961. A review of the rise of civilizations in Sumer, Egypt, the Indus Valley, China and the New World. Brief and to the point with a strong narrative drive – not necessarily common features in books about archaeology! Many excellent photos of material hard to find elsewhere. a History of God Karen Armstrong 1999, Vintage Books From Abraham to the present – the 4000 year quest for god. A robust, thorough and readable book. the Human Past – World Prehistory and the Development of Human Societies ed Chris Scarre Thames and Hudson 2005 This book is vast in scope and written by hundreds of people. The history of everything everywhere. Lots of pictures too. Origins Reconsidered – in Search of What Makes Us Human Richard Leakey & Roger Lewin Little Brown & Co, 1992 Things have moved on a bit but a great scientific tale. Still a seminal book.